I’ve made this ginger beef and greens bowl three times in the past week because it’s that delicious (and also because I had a huge piece of ginger root in the fridge). I first made it last Saturday, after getting home from a seven hour workshop with Steve Maxwell. I was pooped out, but still mustered to throw together this delicious, quick and nutrient-dense meal. The fresh ginger is what really makes this dish pop, but if you’re in a pinch, you can use ground ginger too. Meanwhile, I wish you all a wonderful Memorial Day weekend! I hope you’re able to get outside, play, relax, socialize, grill and enjoy. Melt coconut oil in a large pan over medium heat. Add the onion, garlic and ginger. Stir and sauté 2-3 minutes. Then, add the ground beef and break up with a spatula. Season to taste with sea salt and pepper. Continue to brown the meat, stirring occasionally. After about 5-7 minutes, add the broccoli, coconut aminos, dried basil, cayenne or pepper flakes and bone broth. 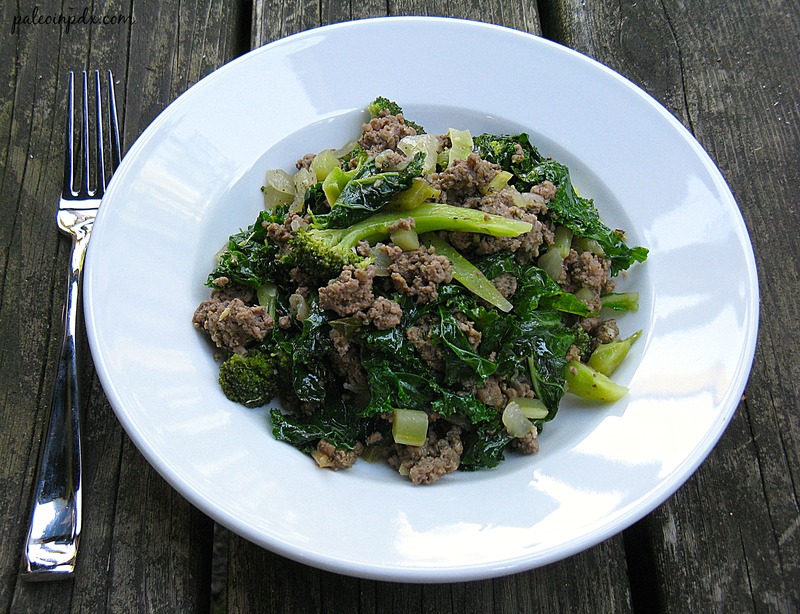 Stir well and continue to cook for several minutes, or until broccoli is softened slightly. Add the kale and stir. Season to taste with a bit more sea salt and pepper. Cook for about 2 minutes more or until kale is softened. Then, remove from heat and serve. I actually forgot how much I liked fresh ginger. Thankfully, I got a huge piece in my last CSA bin. Now, I want fresh ginger in almost everything! Yep, my favorite kind of meal too! Haha…hardly! I average about one post every week or every other week! I love ginger so I had to make this for lunch today! Soooo good–we loved it! It gives me an Asian vibe with the coconut aminos, ginger and basil. I made pickled ginger last weekend so all the extra pieces that didn’t make it through the mandolin are in a baggie in the freezer. I use a microplane grater and it looks like a little pile of snow. I went to a workshop on fermented veggies a couple of months ago and found it very interesting. I’ve been making a batch of something every couple of weeks. I used the pickled sushi ginger recipe from perfectpickler.com. I have their lid that fits on a mason jar and had a batch of cabbage going so I just used a regular mason lid for the ginger. It seemed to work just fine–I let it sit out at room temp for 3 days to ferment then refrigerated it like all the other veggies I’ve done. The hardest part was peeling and slicing all that ginger and reading the directions a few times so I wouldn’t mess it up! Very cool! I’ll have to check out that website and see about giving the recipe a go. The ginger peeling and slicing part definitely seems tedious though, like you said. I don’t think I’d like that part! Glad to find another ginger recipe–for some reason, we’re overstocked right now. I’ve never heard of coconut aminos, though, but now I want to check them out! Glad I could help you out! Coconut aminos are fantastic and taste just like soy sauce. If you can’t find them where you live and don’t want to order online, you can always sub wheat-free tamari. 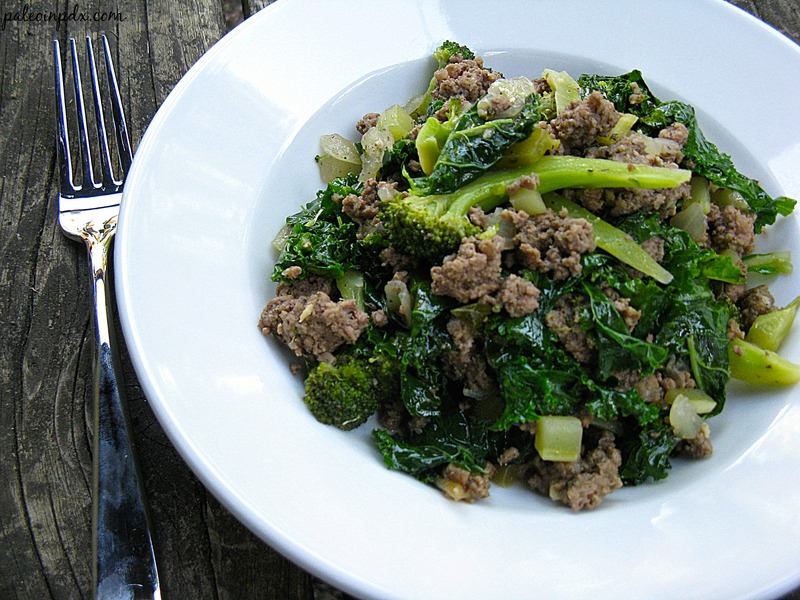 Thanks so much Alisa for sharing this recipe with us as part of our Fast and Easy Paleo Recipe link party!